His top-rated, award-winning eight-piece band and his two excellent Urbanettes jump right in as Mickey takes his audience through a musical medley of his string of #1 hits. 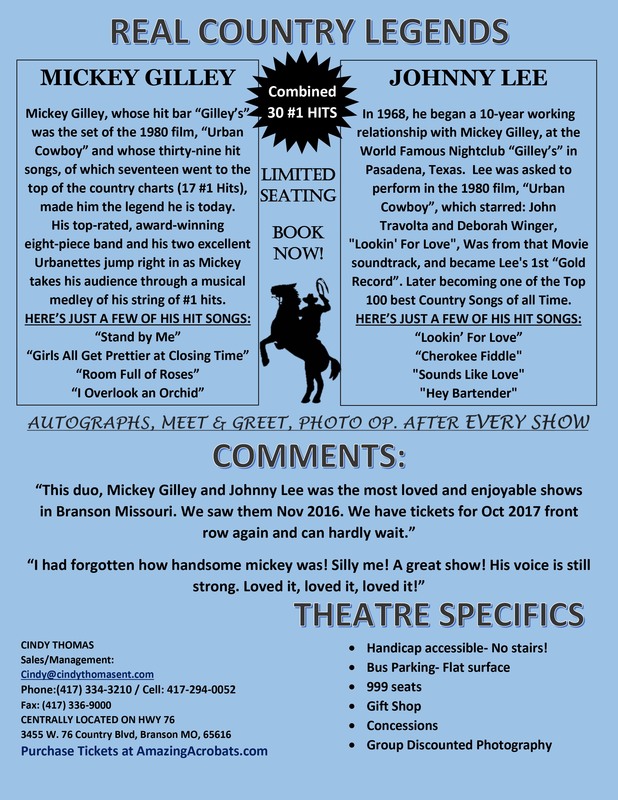 In 1968, Johnny Lee began a 10-year working relationship with Mickey Gilley, at the World Famous Nightclub “Gilley’s” in Pasadena, Texas. Lee was asked to perform in the 1980 film, Urban Cowboy, which starred John Travolta and Deborah Winger. “Lookin’ For Love”, was from the Urban Cowboy soundtrack, and became Lee’s first gold record. It later become one of the Top 100 Country Songs of all Time.